A special thank you to Andrew over at Sports Card Info for the great giveaway! I think I got hosed on the pack contents themselves so to all the other entrants, you didn't miss anything. Over the last several years their has been a steady decline in the quality of the language used on memorabilia and relic cards attesting to their authenticity. Today, in the Chicago Tribune, further details were revealed in the ongoing "jerseygate" scandal* in which a memorabilia dealer, who has contracts with several NFL teams, knowingly doctored jerseys to make them appear game used and then selling them. The team approved contracts provided an unwritten legitimacy to the dealer's unknowing customers, of which, at least one was a trading card manufacturer. The alleged conduct took place between 2004-2008. Take a minute to think about all the football cards in your collection from the beginning of that period to the present . . . It's safe to say that their is a very good chance that even the cards that clearly state that ". . .the jersey material on the front of this card is certified to have been worn by player x in an official NFL game . . .", may be anything but. How does that make you feel? Me? It makes me angry. While the proliferation of jersey cards has relegated them as just another insert in the mind of many collectors, I still value the ones in my collection which connects me closer to my favorite teams and players. As of today, no trading card company has come forward to say that they were a victim of the scam. While doing so might seem like a publicity nightmare, getting ahead of an issue that is sure to come to light at some point anyway (everything in this industry does) would seems worth considering. What I find peculiar is the timing of the investigation and these alleged activities. 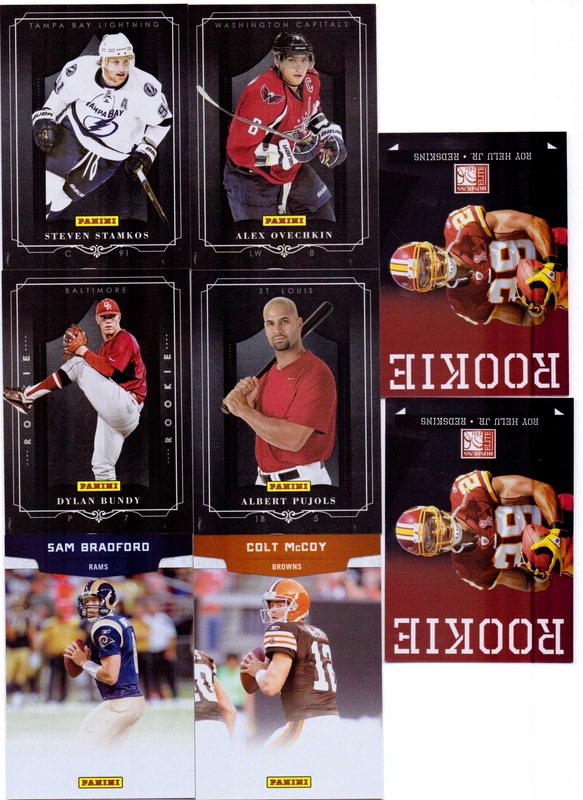 It is during this time frame that full disclosure slowly went down hill regarding memorabilia card backs. It also coincided with certain companies losing league licenses. Now I have no proof, and I am not even speculating that these events are anything more than a coincidence, but it certainly is worthy of some thought. The investigation, indictments, and forth coming trial for two of the dealers accused of allegedly doctoring jerseys and selling them as game used continues to draw nation media attention. Unfortunately, none of it is good. "Now teams look at us as an industry and say this is a scuzzy industry," said Troy Kinunen, who in 2005 founded the prominent authentication firm MEARS Online Auctions. "And the collectors who continue to perpetuate this, to continue support people involved in this kind of stuff, they're not helping themselves." ". . .experts and collectors routinely cite how the industry is littered with hucksters and scam artists. There is no single regulatory entity with oversight. Third-party authenticators often serve as dealers as well, a potential conflict of interest." "According to court records, Oldridge admitted that from 2004 to 2008, he and others doctored jerseys and then sold them to other companies, including trading card businesses. Five others were charged as part of a five-year federal sting. " " . . .collectors and experts said it's essential to be knowledgeable on authentication — a complicated process where there is little agreement on what constitutes best practice." "Photo-matching can be faked. It's a very amateurish way of authenticating," he said. "It's almost impossible to tell on a modern jersey if it's game-worn." "There's a lot of bad anecdotal information that people have just accepted as fact." "Peter Nash, a collector, blogger and author who has helped expose counterfeit items, said investing in memorabilia is always a risk for casual fans who don't do enough research. "It's a total minefield," Nash said. "You're going to get burned left and right." Here are the accused dealers, some of which have already reached plea deals. Needless to say, steer clear. Historic Auctions, LLC, both Florida businesses, from late 2005 through the middle of 2009, in two counts of mail fraud. MITCHELL SCHUMACHER, a resident of Wisconsin, using the trade name MS Sports. They got her intro perfect. Finishing move is killer. Could have done better on the face but overall really good likeness in mannerisms and movement. All Topps apologists should probably just skip to their next item in Google Reader as you won't like want I have to say. On second thought, maybe you should stay and hear it anyway. The fact of the matter is that I am no longer and never was the Voice of the Collector. Reason being is that I am apparently in the minority on a number of issues and always have been. That's OK, I still believe that certain issues need to be addressed and this is one of them. Topps flagship baseball is good for one thing and one thing only. Lining the pockets of their corporate executives and board of directors with cold hard cash. YOUR hard earned cash. When was the last time that a hot prospect or star RC card from any series of that product was worth more than the cost of the ink and card stock used to print it? 12 Years is the answer. With the insane phenomenon that was Pujols and Ichiro and they weren't even in the base product if I remember but actually Chrome so that doesn't even count. Next. The real answer is probably some 30 years ago when dealers sold rookie cards by the brick. Seriously though, the Mike Trouts, Stephen Strasburgs, and Bryce Harpers, etc. of recent years, a few bucks at their peak, at the most, if that. You might argue that it has more to do with collectors wanting a more premium or autographed rookie card and thus kicking in supply and demand principles of Econ 101. I don't think so. It has been several weeks since Upper Deck Series One Hockey released and last night I sold a base rookie card, of Ryan Nugent-Hopkins for $91. ARE YOU KIDDING ME?!?!? $91!!!! No serial numbering, no memorabilia, no autograph, just a short-printed rookie card (inserted 1:4 packs). This is not an anomaly based on the player, this year's particular release or any other flash-in-the-pan, one and done criteria, this is simply a winning formula that puts the best interests of the collector first. Game changing?!? Really Topps, NOTHING, I have seen released about the 2012 product can remotely be described as "game-changing". But you know what would be? That's right, a complete and total remake of the flagship product from the ground up. I know set-builders will deride the notion of short-printing rookie cards and I have a solution for them that would come at the end of the year allowing the rest of us to actually earn some sort of return for the money spent on the base series attempting to complete it throughout the year. I am thinking a combination of O-Pee-Chee meets Upper Deck Hockey. Go back to claystock, include gum for the kids, increase the actual size of the base set to 810 cards. 25 players from the 30 clubs plus 2 rookies per team. Short print the rookies. Forget the parallels. Limit the non-auto inserts to 90 cards total. A 900-card product that would fit into a 100-page, 9-up sheet binder. Instead of memorabilia cards, randomly insert a redemption card for a collector binder similar to the ones you charge for now. You save the cost of the memorabilia cards which no one cares about anyway and you encourage and throw a bone to your long shunned set collectors so just do it. An Update set should still be produced. Limited to expaneded 40-man roster players, traded players, post-season highlights, award winners, and a rookie variation of all 60 previously released RC's. This product should release on Black Friday. This will allow plenty of time to turn around September call-ups and post season highlight and award winners. To add further importance to this set, get rid of regular Bowman, and Topps Chrome. Ahhhhhh!!! He's insane! Kill him!! What did he just say? You heard me. It's redundant. They both are. Prospectors and rookie collectors value Bowman Chrome over the regular version and set collectors value the regular over the Chrome version. Problem solved. Mission accomplished. "Buy it you stupid collecting suckers." . . . and we do, with no expectation of anything better.